While reading the Times of India on the 4th of October, I was pleasantly surprised to see a St. Bernard peeping out of the logo. Surprised –? I looked again – but there he was, sharing this prized positioning with other animals. 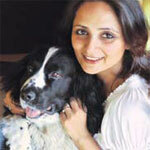 And it was then I realized that it was World Animal Day – a day to celebrate with our pets. World Animal Day celebrates and respects our relationship with all life forms, to acknowledge and be thankful for the roles they play in our lives. The best part is that it is celebrated enthusiastically world over, irrespective of beliefs, nationalities and backgrounds. It is indeed a common platform wherein people come together to celebrate the priceless bond they share with their pets. Be the best pet parent/guardian. Routine vet checks are a must – though I am really scared of them!! Sniff life together on your morning, afternoon and evening walks (More the merrier!!). Definitely go for picnics and holidays together. Most important?–?spend quality time?–?I particularly like playing fetch and the scratch on the belly is the best. Presents?–?they are always welcome?–?especially if it is a yummy chew or a squeaky toy. Meanwhile, here’s wishing you a Very Merry Christmas and A Very Happy New Year from our entire team. Also let’s ensure that each and every day, we give our darling pooches – THE Very Best…. Your Dog is Talking to You Are You Listening? A dog is about to bite but can you tell? Find out about DOG BREED PROFILE. Find out about DOG NUTRITION. Find out about DOG HEALTH.